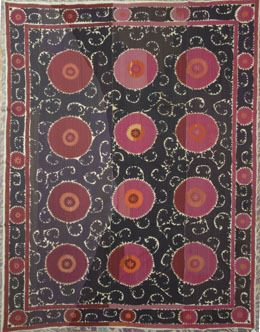 ‘Sus’ is the Persian word for ‘needle’ and thus a Suzani is a rug or textile created by needlework. 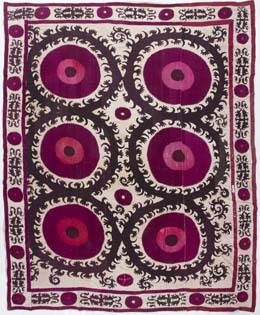 More precisely it refers to the exceptionally colorful Uzbek silk embroidered textiles on linen, cotton or silk grounds. They are always essentially floral with extraordinary varieties of flowers, rosettes, buds, vines, birds and medallions. They are terrific wall hangings, totally authentic and ethnic, bringing the exoticism of a Central Asian bazaar into any room. Sizes and formats vary, from under 4’ by 6’ to 10’ by 12’, and there are portiere/prayer layouts. There are numerous distinct types with no two examples identical. The best antique Suzani textiles are true works of folk art and highly collectible.